Generating predictable revenue requires plans and processes that look beyond lead generation to deal acceleration and targeted marketing throughout the marketing and sales funnels. As most marketing departments are now intimately involved in revenue creation, not only are they driving leads at the top of the sales funnel they are also providing content and market intelligence to keep prospects warm as they advance through the middle and later phases of the funnel. Because of this shifting role, most high growth companies now view their marketing organization as essential to achieving their top line goals. 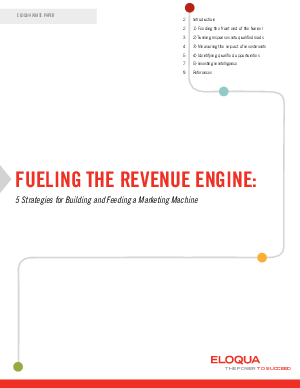 In this white paper we will examine 5 key areas of funnel economics and provide examples of how marketing departments can fuel the sales funnel and have a pronounced effect on how their organizations grow revenue and establish a strong competitive position.